Sometimes when I want to write about a word, I'm surprised that so little has been written about it. This is not one of those times. When it comes to the word totafot טוטפת (or טוטפות) it seems that absolutely everyone is getting into the game. I'm not sure how to organize the discussion, with so many opinions. So bear with me if it seems a little scattered today. We learned in a b'raita: "Totafot," "totafot," "totafot." That makes four [compartments within the tfillin box]; these are the words of R. Yishmael. R. Akiva said: We do not need (this exegesis): "Tot" in Coptic means two, and "Fot" in Afriki. As we've seen before, Rabbi Akiva is not afraid to derive biblical words from languages other than Hebrew. (However there is a lot of apologetics out there, saying that there is of course no way that a biblical word could come from any language other than Hebrew). Steinsaltz writes that the Coptic word is "aft" meaning "two", and "Afriki" means Phrygian in which פת means "two", and is connected to the Greek bathos, meaning "both". This word means "tefilin". Because they are made of four compartments, they are called totafot. For tat in the Kaspi language means two, pat in the Afriki language means two. Menachem (ben Saruq) in his notes (connects it) with: והטף אל דרום "And speak" to the south." (Yechezkel 21:2) and אל תטיפו "Don't speak" (Micha 2:6). These are terms for speaking, like "and a reminder between your eyes" (Shmot 13:9) which is said in the first section, for whoever sees them tied between the eyes will remember the miracle and speak about it. No affinity is known to this word. Linguists (meaning Menachem), however, associated it with the expressions: 'v'hateiph' (And speak) to the south; And my word 'titoph' (dropped) upon them. The figurative usage thereof is based on the verse: And the mountains shall drop (v'hitiphu) sweet wine. Thus the verse is saying that you should make the exodus from Egypt a sign upon your hand,, and between your eyes a source for discourse distilling as the dew upon those who hear it. Our Rabbis, however, have called an object which lies upon the head totapoth, just as they have said (Shabbat 57a): "[A woman] many not go out [on the Sabbath] with a totepeth or head-bangles." Rabbi Abahu said: "What is totepeth? It is a forehead-band extending from ear to ear". 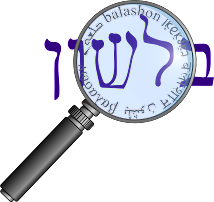 Now it is the Rabbis [of the Talmud] who are the [true Hebrew] linguists, as they spoke the language and knew it and it is from them that we should accept [the explanation of the word ultotaphoth]. Why was the Ramban so critical of Menachem? The Ibn Ezra on Devarim 6:8 gives us a clue. He writes that the Karaites say that totafot derives from the root הטף (as we've seen Menachem say). He claims this is not possible, for the root of הטף is נטף - and totafot has no nun and two tets. In regards to the Ibn Ezra's proof from the difference between נטף and טוטפת, Tigay (also the author of the JPS Devarim) discusses in this comprehensive article, On the Meaning of T(W)TPT how there is a precedent for such a shift in letters. He gives the example of לבלב becoming לולב, and the Ugaritic kbkb being related to the Hebrew כובב. However, just because the root is נטף, it doesn't mean that totafot didn't refer to something physical, worn on the head. While הטף does mean "to preach", the earlier meaning is "to drop, drip" from where we get the word טיפה tipa - drop. Amos Chacham in the Daat Mikra says that jewelry worn on the head would "hang, drop down", and we find jewelry called netifot נטיפות in Yeshaya 3:19. And with all this said, I still haven't scratched the surface. Rav Kasher, in the appendix to Torah Sheleimah Parshat Bo, has an article that lists eleven explanations to the word totafot. (Tigay quotes another article that has 21). Aside from what we've already discussed, Kasher quotes the Chizkuni and others who say it may be related to the Aramaic word מטייפין - "will see". (Maybe this is an example of an alternation between tet and tzade - צפה also means "to see".) Kasher connects this theory to the opinion that a blind person is exempt from tefilin.